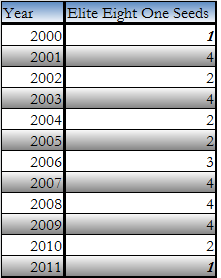 This year is the first time since the 2000 tournament that only one number 1 seed made it to the Elite Eight. It has happened only twice since the tournament expanded to 64 teams in 1985. In 2000, the remaining number one seed Michigan State benefited from the upsets and won the tournament. This year’s number one team, Kansas, has a chance to match up with Florida, the same team that played Michigan State in the national title game. However, I don’t think Kansas will be as lucky as Michigan State. If they reach the title game, as they probably will, they will have to play a very strong team capable of beating them. Three of the potential match-ups can easily see Kansas on the losing side; Arizona, Kentucky, and North Carolina.